We have a mailing list of people looking for this rabbit. This bunny has turned out to be one of our most requested toys. So many families have asked for help finding one that I fear I may have lost track of someone who needs one. We received an email this morning thanking one of our readers, Jennifer, for helping Mandy find one she had asked for a long time ago. So, I am running the request again for Venessa, who I think is the only one who still needs one. If I find anyone else among my files who never did get one, I will add their name, too, and if you are one of those looking and I need to add your name to this new post, please let me know. I am looking for a pink bunny. It is made by Carter’s Just One Year. I purchased the bunny in the Spring of 2006. It is about 11 inches tall, pink with purple flowers on it. It has a musical pull on the back. If you can help Jessica find this Carter’s Musical Bunny, THIS SITE IS NO LONGER ACTIVELY MANAGED. Please use Our FREE FACEBOOK GROUP, including #041408-1 in the subject, . I NEED THIS PINK TARGET BUNNY TOO. Wow! Quite a price tag on these two!! But I ill send the links to them all, just in case. I also need one of these bunnies. Please help! I have added your name to my list, Alexia. There are two on eBay right now, but they are $69.99 and $125.00! Search for Carter’s Just One Year Music* Pink Bunny and you should find it. buy it now of $39.00 pretty good! Here’s another one. The seller says that they’re not trying to make big money, so maybe if you’re the first person, you could ask them to end it early with BIN??? I sent both of the links off to my list of TEN who are searching for this lovie. The last one was bought by someone who used the links in the comments here to buy it, and she wrote to thank me for the site. eBay 260262260980 and 160261381766 and 310067606580. 120297986842 Ebay, here is the one you are looking for. I sent the link to everyone again. It has been amazing to me how many people are looking for this one toy!!! I am searcheing for the pink bunny also. It was my daughter Natalie’s first toy when she was born. Her 2nd b-day will be on Dec. 22nd and I want to get a new one for her. We feared we had lost “Bunny” and it was pretty sad around here =(!! “Bunny” was found but is in horrible shape! I fear bunny will get lost again or simply fall to pieces. My problem is that I can’t afford a new one. We have come on very hard times this year and have had to move 4 times and now we don’t have a home of our own. So my daughter clings to “Bunny” even more now. Truth is, I think our whole family does. We all love “Bunny” and feel like she is part of our family. “Bunny” is home to my little girl. If any one is able and willing, please help us. Thank you and my God bless you! Do not know if there is still a mailing list for this one? Prices have dropped since the earlier comments. Thanks, Carrie. I do still have a mailing list, but we’ll see if any of the email addresses bounce. Thanks, Carrie. It’s a small mailing list and pretty old, so I’ve asked that they reply if they don’t get one. Otherwise I’ll close this search. Let me know if someone is interested in it! 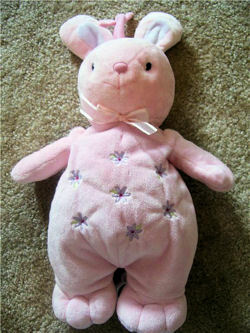 We are in search of this bunny, my daughter’s beloved BunBun –If anyone has still, please let me know! I can’t believe how many children have fallen in love with this bunny. My daughter believes he is real and is magic (she just might be right). She’s had him her whole life… She’s 8 now … Never spent one night without him. He’s been ripped, seen, lost an eye, tail, had his mouth sewn back into a smile… But I fear for the day he literally disinigrates and desperately need a new “bun bun”.